I am very quiet on the blogging front these days and have so much I want to share but we will get there. Colin has went back to work and I’m trying to find my ‘normal’ and get settled into a routine when it’s just the 3 of us. 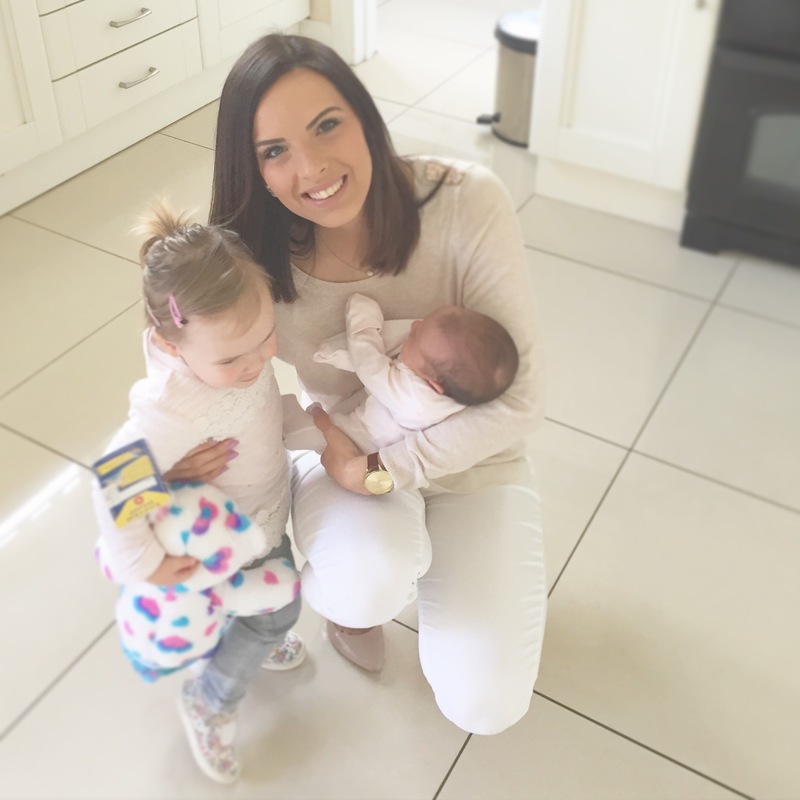 I get asked everyday how I am finding having a newborn and toddler, it’s definitely busy and at times challenging so that’s normally my answer, it’s the textbook answer and it’s true. All the ladies before us that have rared children have had us warned but with so many families with more than 2 kids it’s clear that they too found that the enjoyment, amazement and love that you have for these little people far outweigh the busy, exhausting and hard times. So here’s how things have been around here. Bella is going into the typical ‘trying twos’ as I decided to call it a while back and is communicating her frustration or lack of understanding with full blown tantrums. 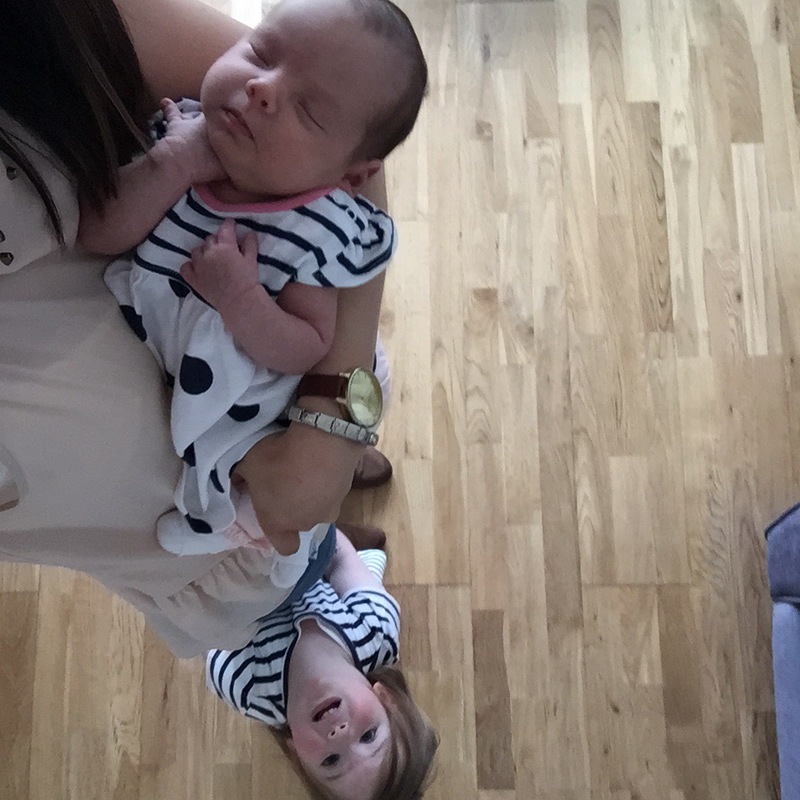 When Annie was 7 days old, Colin went to football and I decided to bite the bullet and get the 2 girls out of the house to the football match (I attend one every year to 18months, I am in no way a supportive footballers wife). Everything went well we were all ready and out of the house in relatively quick time. 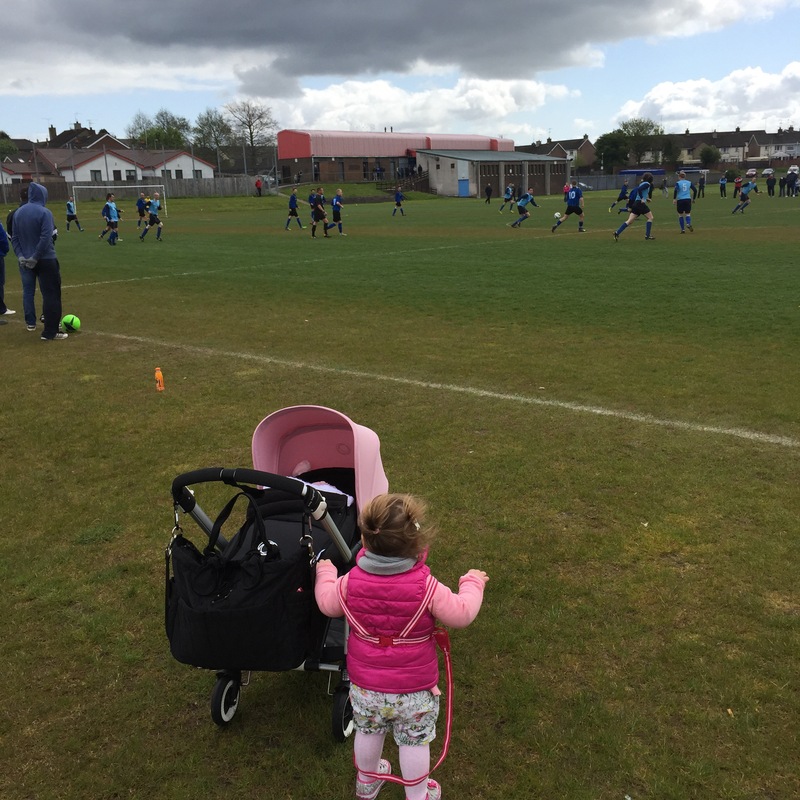 After being at the match for about 3 minutes Colin ran up the side line… Bella spied him and he ran off, Bella tried to run on to the pitch to him and as that was unsuccessful she lay down on the grass whaling, kicking and screaming. Hail stones started so Annie began to cry and I found myself holding Bella like a rugby ball with one arm and pushing the pram with the other while trying to flee the scene. The spectators all turned 180Degrees and instead of watching the match they were watching wrestling. By 12 minutes into the outing we were back in the car with hormonal/ postnatal/ stressful sweat beads on my face and Bella in the sweetest voice saying ‘sorry mummy’ and smiling. I could only laugh and give myself a pat on the back for getting out of the house on my own. So that’s how we are doing it… Focusing on the positives and going easy on ourselves. Is this what life with a newborn and toddler is like? NO, it’s far from it! This was 30 minutes in 3 weeks. We have multiple tantrums each day (yes ‘we’) but they are mild and in 2 minutes forgotten about. It’s going to be hard and I expect it to get harder the more Annie wants my attention. It is exhausting especially because I am feeding Annie myself so I am getting no break on nightfeeds and recently we have been cluster feeding ALL.NIGHT.LONG. Bella has now decided to wake at 5am and that’s when we start the day shift. The day’s Colin is off he will get up with her but I am very lucky that I have my family close by and they pop in to entertain Bella for a while or take her for a few hours. This is priceless and gives me time with Annie and I hope soon, once I can leave a bottle I can get a hour with just me and Bella too. My normal is now spending most of my days nursing a tiny baby but instead of spending the whole time gazing into her eyes wondering who she is like, 50% of the time is being ‘meals on wheels’ and walking around with baby attached to me and holding her with one arm while trying to get peppa pig from under the sofa, making Bella juice/ something to eat with 1 hand or cuddling Bella too. 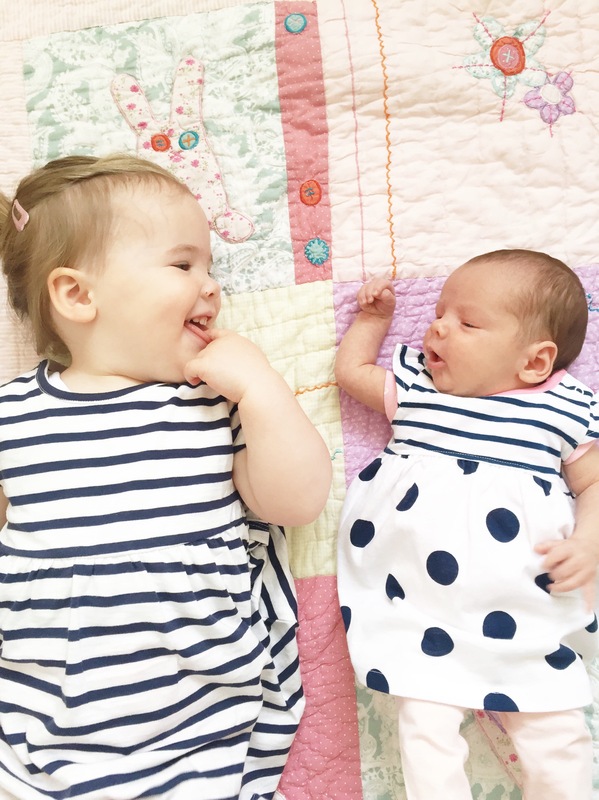 With Annie being my second I find myself so much more laid back, the life changing experience of becoming a first time mum takes more time to adapt to than adding another one in. Annie has had to slot in with our routine and we don’t get the time to stress and fuss. I don’t stress about her whimpers as she lies in her basket, if she gets a fresh babygrow on at night and it’s still clean in the morning it stays on and babygrows are the everyday outfit (unlike the dresses and bows Bella was in from day 3). I feel so much more laid back all around this time perhaps it’s coming from a worrying and pretty hard pregnancy, to make it through with a healthy little baby has been a massive relief and I count my blessings everyday. 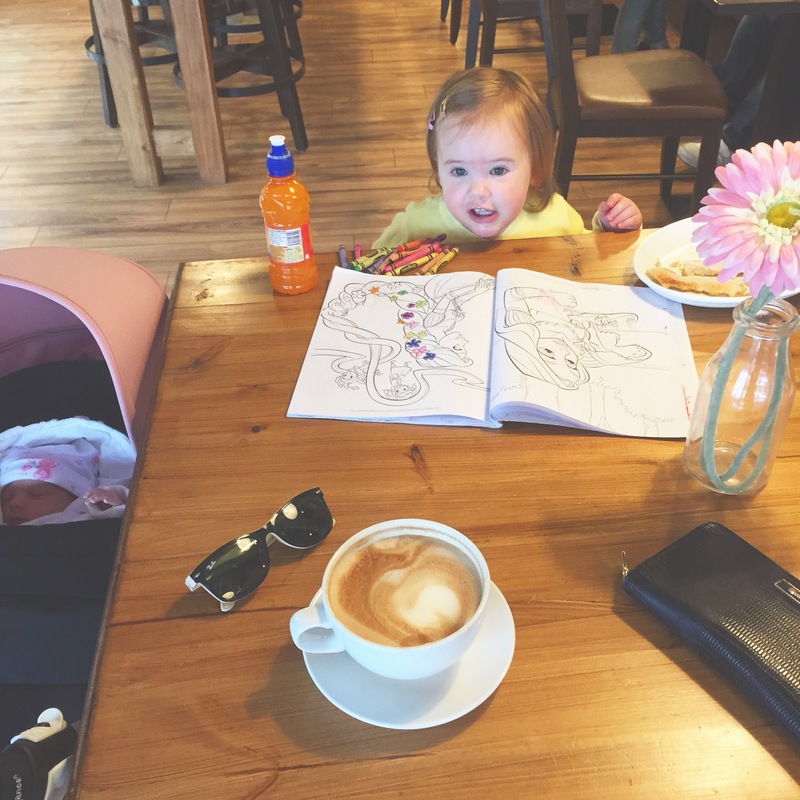 I am more laid back with Bella, she’s nearly two so tantrums are normal, she’s learning and wanting to do things like wear pjs and her new shoes to bed and that’s fine we will go with it. 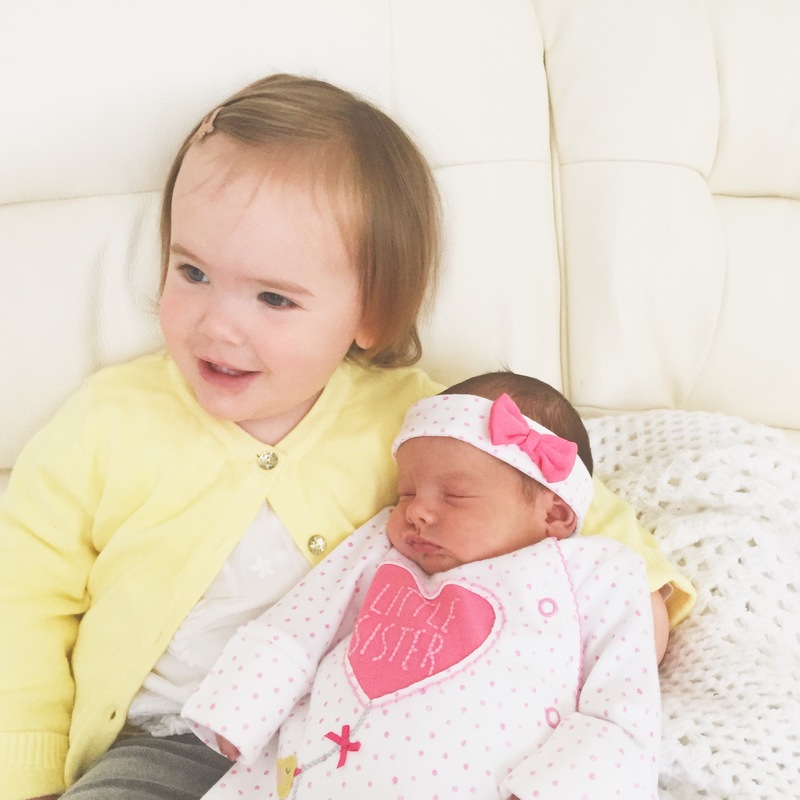 Bella is loving her baby sister and her role in ‘helping’ mummy, we have watched her fall in love and find it funny how protective she is of Annie especially when other people are around her. I am also realistic with my little baby, she has been used to being warm 24/7, held tight in the womb, hearing my heartbeat, being fed on demand and not have her little limbs being bent to go into clothes etc so I am not surprised when she wants to feed all night long and lie on my chest to hear my heart beating all day as this is strange and new for her too. My main aim atm, along with giving Bella attention is to really enjoy Annie. 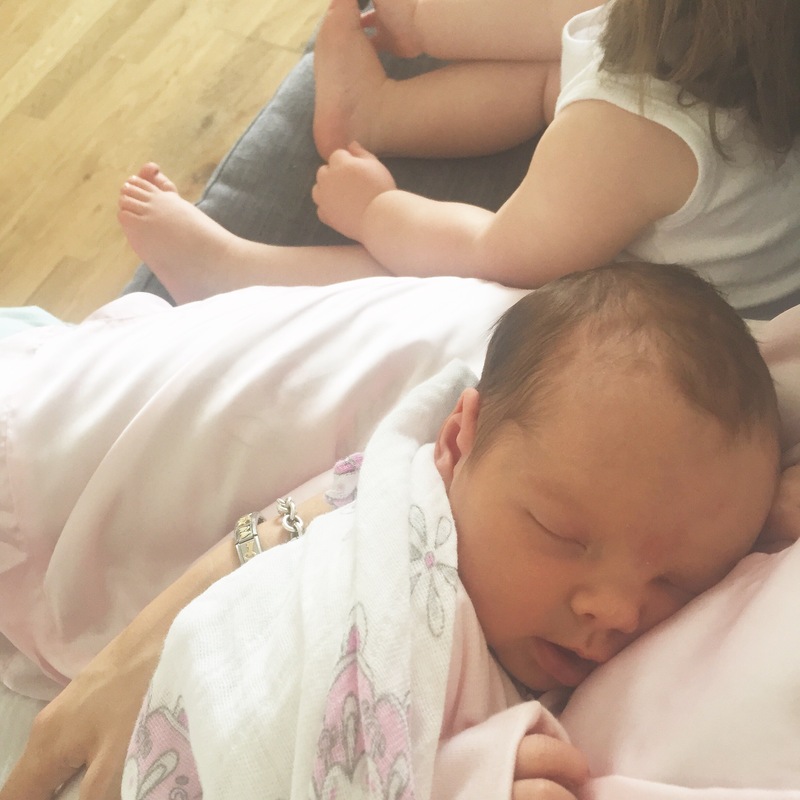 I am trying to inhale her newborn smell and remember it, enjoy holding and snuggling the tiny little body in my arms and take peace in the nightfeeds when it’s just the two of us. These really are fleeting days and I know this first hand. I am enjoying motherhood even more this time, I feel more self assured and with this more relaxed. I am going easy on myself and not expecting too much. My aim each day is to get up and dressed, have some fun with the girls and keep everyone fed. If I manage to get out of the house or the house cleaned then that’s a bonus. 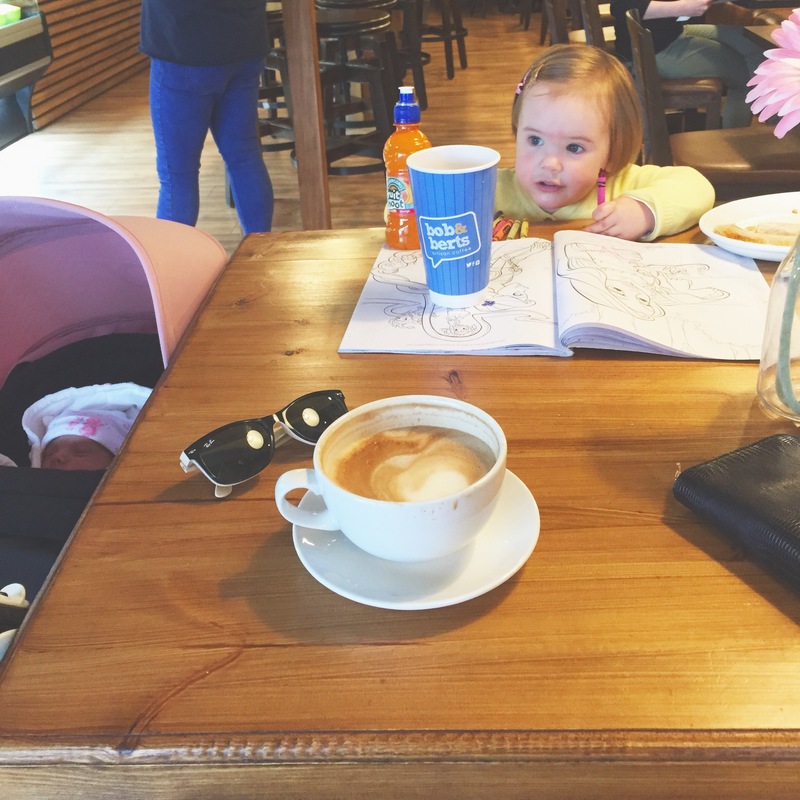 We got out of the house again just the 3 of us and headed out for breakfast, with Bella not going in a pram I wouldn’t do a shopping trip yet with both of them but this was lovely. No tantrums or tears (this time, easing me in gently) I sat as proud as punch thinking that this was the first of many coffee shop dates with my girls, before school plays, before dress shopping even before wedding dress shopping and with every stage it too will be busy and the challenges will change, so for now we are living in the moment and savouring all the little things.